Trainline is doing everything right at the moment. You may have noticed a rebrand in August 2015 alongside the launch of a refreshed mobile app. The app has now been released for iPad, too. And, relief, there’s an Apple Watch version for travellers in first class (I’m joking, don’t take me for a Corbynister). Trainline has brought mobile development in-house and is moving much of its infrastructure to Amazon Web Services as it seeks to use all the resources it can to improve customer experience. For now, let’s keep it lighthearted and look at some of the lovely features of the Trainline app that should inspire you for your own projects. A wonderfully simple demonstration of UX, these turquoise dummies make it less easy for those without their glasses or in a rush to select the wrong values here. I always travel in fives. Probably the major development of the Trainline app. All you need to give is a name and your payment details and you can purchase a ticket and leave town. Guest checkout is something many ecommerce sites do not do. Even in an app, it makes sense, as people forgetting their passwords are often a major cause for abandoned purchases or customer services enquiries. New font, demure shading, stamped borders, coy colour scheme. There’s something Apple-esque about the design here, it sings. This is the second major improvement to the app, tickets with live updates including platform numbers and journey progress. This should help encourage users to move to mobile ticketing. I wish it did take five minutes to travel London Bridge to Brighton (that way, Croydon would be only a blur). Trainline’s rebrand has seen a whole lot more personality injected across ad campaigns (TV’s ‘I am Train’) and also UX and copywriting. Whilst some might bemoan the infantilisation of marketing (started by Innocent smoothies), Trainline does well with this approach. There’s something about the hell of train travel that benefits from a cheeky wink during the booking process. 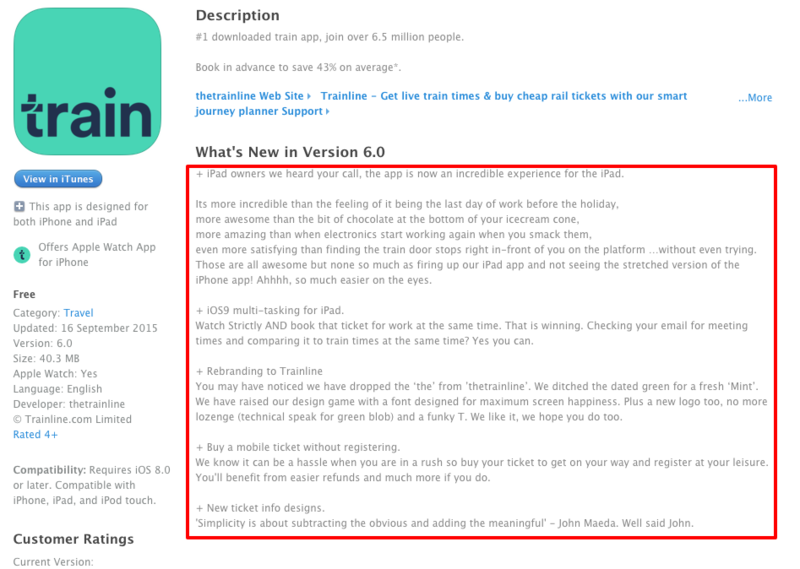 Below are some examples of Trainline’s pep – a nicely chosen quote, a shining star (in mint, again) and even the copy from the app store, which nicely delves into the design updates. Not quite a student band name. These overlays on first use are just the sort of notifications that users need. They inform me not how to use the app – which is fairly intuitive (cue commenters telling me there’s no such thing in UX) – but why to use certain functions. No queuing, no booking fee etc. Alongside the new dynamic mobile tickets (showing journey progress), the ability to download timetables and access live departures eats into the territory of the National Rail Enquiries app, which many have used to keep abreast of this information. For those recidivists like me who still love a good timetable, the only thing missing is the joy of the concertina fold. Even the field titles could not be more succinct. Any thoughts on the app? Let us know in the comments below. For more information on mobile development, download the Econsultancy Mobile Web Design and Development Best Practice Guide.